With his great talent for shape and design, Sascha Brastoff (1917-1993) made hand-painted vases, bowls, ashtrays and figurines with his trademark overglaze gold trim and imaginative, flamboyant decoration. This unique smoking set displays a modernist flair. 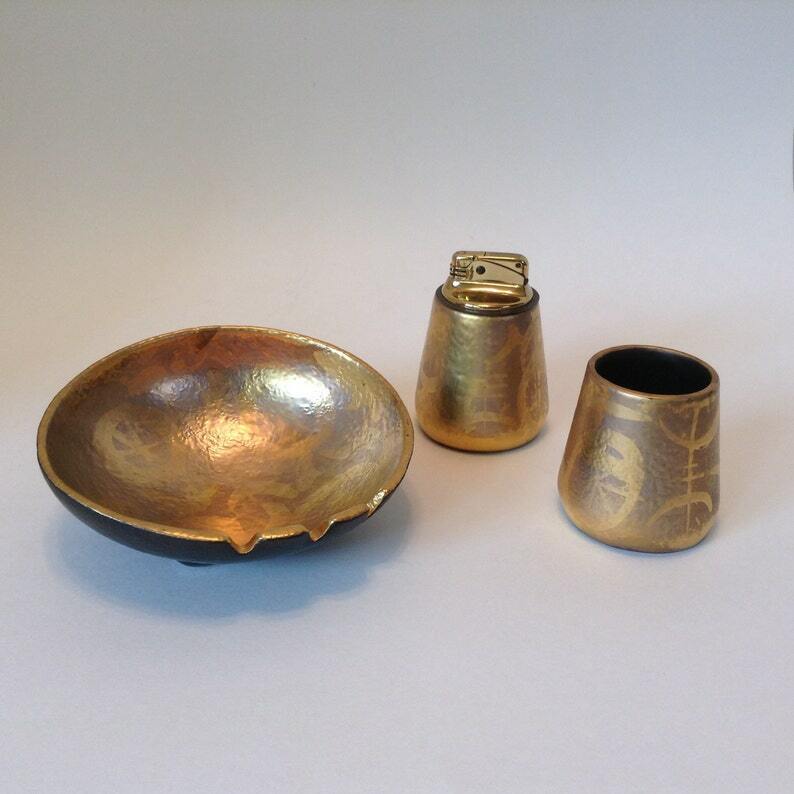 The “More Gold” pattern is produced of textured pottery with a dark matte brown under glaze, a burnished gold base color, and a brighter tone gold overlay in circular shapes and abstract designs. No wonder Sascha Brastoff has become a favorite with collectors – these pieces are beautifully different! The set includes a cigarette lighter, cigarette cup and ashtray. The pieces are in excellent vintage condition with no chips, cracks, nicks, repairs or discoloration. There are three pin prick glaze skips on the bottom of the ashtray (see photo five). Other than that, I don’t believe they’ve ever been used! The lighter measures 3 3/8" tall by 2 1/2" at widest / lower part of base and 1 7/8" at the smallest / higher part of the base. The lighter mechanism opens and closes easily; the metal surface is mar-free. There is no fluid or flint in the lighter. The piece is marked on the bottom in gold: SASCHA B ® L1. The cigarette cup is shaped exactly like the lighter – measuring 2 1/2" tall by 2 1/2" at widest / lower part of base and 1 7/8" at the smallest / higher part of the base. The piece is marked on the bottom in gold: SASCHA B ® L1. The ashtray is a lovely form measuring 5 1/2" wide and 1 3/8" tall at the lowest end where the cigarette holder slots are and 2 3/8" at the opposite end. The piece is marked on the bottom in gold: SASCHA B ® F5. It is my understanding pieces signed with the signature "Sascha Brastoff" were his own work; pieces marked "Sascha B" or with a stamped mark were made by others in his West Los Angeles factory, Sascha Brastoff of California, Inc, which was in production from 1953 until about 1973.